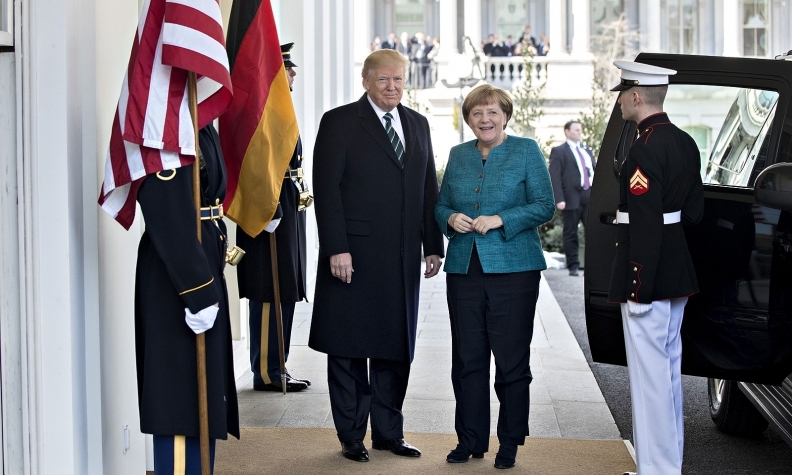 President Donald Trump welcomed German Chancellor Angela Merkel to the White House on Friday to discuss trade and other matters. Editor's note: An earlier version of this story omitted the given name of Bernhard Mattes, president of the American Chamber of Commerce in Germany. President Donald Trump said Friday he expected the United States to do "fantastically well" in trade talks with Germany, while German Chancellor Angela Merkel said she hoped the United States and the European Union could resume discussions on a trade agreement. Trump said he did not believe in isolationism but that trade policy should be fairer. "We held a conversation where we were trying to address also those areas where we disagree, but we tried to bring people together ... (and) tried to find a compromise that is good for both sides," Merkel said at joint press conference with Trump after the two leaders met at the White House. Germany's $54 billion trade surplus with the U.S. has been a source of tension between Washington and Berlin. 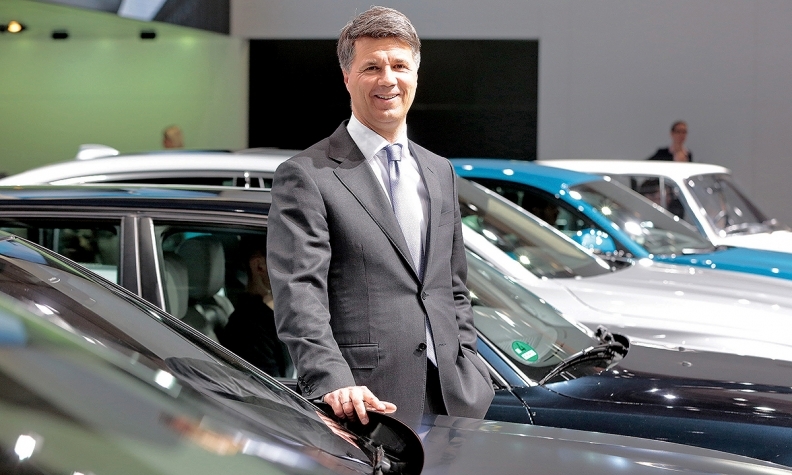 BMW CEO Harald Krueger and two other German CEOs joined Merkel in her White House meeting with Trump amid rising tensions on trade issues. The meeting, which had been scheduled for Tuesday, was postponed because of a snowstorm. Faced with Trump's "America First" policy and threats to impose tariffs on imported goods, Krueger and the heads of auto supplier Schaeffler and industrial giant Siemens stressed how many U.S. jobs are tied to "Deutschland AG." BMW's South Carolina plant is its largest factory in the world. The carmaker is expanding the plant to have the capacity to build 450,000 vehicles annually, with 70 percent for export. "We have a joint interest in ensuring that the global conditions for continued growth and investment are maintained," Krueger said in a statement after the meeting. "With 'Made by BMW in the USA' we will continue to contribute to the ongoing economic success of the USA. Plant Spartanburg, our largest manufacturing facility in the world, is a great example of this." Trump has warned that the U.S. will impose a border tax of 35 percent on cars that BMW plans to build at a new plant in Mexico and export to the U.S. market. BMW expects to invest $2.2 billion in Mexico by 2019. Mexico's lower labor costs and unique free trade position mean it now accounts for a fifth of all vehicle production in North America. BMW's Krueger: "America profits from free trade. We are supporters of free trade and not of protectionism." "America profits from free trade. We are supporters of free trade and not of protectionism," Krueger told reporters last week at the Geneva auto show. Merkel, who presides over Europe’s biggest economy, can be combative on trade. After Trump suggested there’s an abundance of Mercedes-Benz cars on New York’s Fifth Avenue, she responded last month by noting the number of Apple iPhones in use at a conference in Munich attended by Vice President Mike Pence. “We’re proud that we have good products, just as the Americans are proud that they have good products,” Merkel said. Merkel told business leaders in Munich on Monday that free trade was important for both countries. German chancellors have a long tradition of taking groups of business leaders along with them on trips to important countries. The three CEOs discussed the German practice of training workers on the job while also sending them to classes at a vocational school to obtain formal qualifications. Such training is traditionally offered by large German companies both at home and in their foreign operations, and is particularly prized in emerging economies, where it helps German corporations win business. Sources of tension between Berlin and the new U.S. administration also include an accusation by a senior Trump adviser that Germany profits unfairly from a weak euro. "The accusations of President Donald Trump and his advisers are plucked out of thin air," the president of Germany's VDMA engineering industry association, Carl Martin Welcker, said in a statement on Monday. He said 81,000 people were employed in German-owned engineering firms in the U.S. with more than $32 billion in total revenue, while German export successes were linked to the high quality of goods, not foreign-exchange effects. As part of a bid to bring jobs to America, Trump has urged automakers to build more cars in the U.S. and discouraged them from investing in Mexico. Trump's order banning citizens of some majority-Muslim countries from entering the U.S. and a threat to tear up the North American Free Trade Agreement have also unnerved business leaders. Germany and the U.S. must work hard to prevent a deterioration of trade relations, Bernhard Mattes, president of the American Chamber of Commerce in Germany, said on Friday. "Even though we currently see the likelihood of a trade war between the United States and Europe as small, the topic is still present and not completely off the table," Mattes wrote in a column in the Handelsblatt business daily. "We call on those responsible to do everything possible to avoid a standstill or even a worsening of our trade relations," added Mattes, who was head of Ford Motor Co.'s German operations through last year. "In a trade war, there can be no winners as the global economy is too networked and our supply chains too international." Mattes noted that the U.S. has had a trade deficit for much of the last 35 years with the deficit growing tenfold during the fastest period of U.S. growth of the last 50 years, from 1983 to 1987. "Protectionist measures like punitive customs, import taxes or the termination of international trade treaties would therefore only help the U.S. economy temporarily," he wrote.